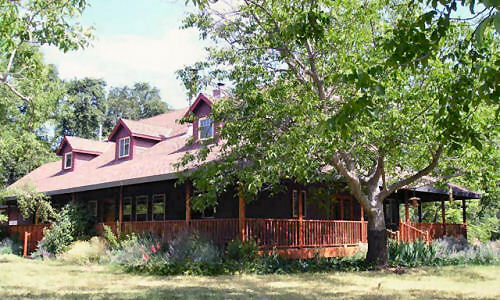 Cache Creek Inn is a lovely craftsman home set amid 2 acres of walnuts. Guestrooms are upstairs, overlooking the hills and orchards. Each large sunny room has its own new generous bathroom and window seat for viewing. Nearby: rafting and kayaking and tubing on Cache Creek, hiking in the hills managed by BLM, swimming holes for cooling dips. Cache Creek Casino is a short distance down the road. Directions: From its intersection with Interstate 505, take Hwy 16 northeast toward Esparto. Travel 18 miles to Rumsey. Beyond Rumsey, 1/2 mile, turn Left onto Rumsey Canyon Road. Cache Creek Inn is the first house on the left side of the road. 2996 Rumsey Canyon Rd. Room rates: $85/night with breakfast. Each room has a queen size bed with plump mattress and very comfortable linens. Additional futons can be brought into each room. In addition, there is a common room between the two bedrooms that has a bunk and futon which can be used for additional guests.